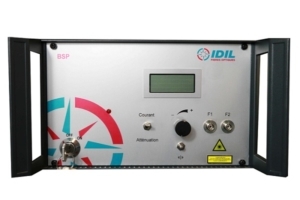 IDIL Fibres Optiques designs and manufactures pulsed SLED source at 680nm. IDIL Fibres Optiques can deliver broadband pulsed light beams at a wavelength of 680nm. 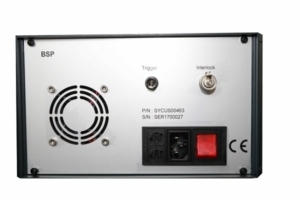 A rotary encodor adjusts the pulse width (between 1µs and 500ms), the attenuation (between 1 and 60dB) with a light pulses frequency between 10Hz and 50Hz. Please contact us for more information on the parameters that you need for your application or custom requests. IDIL Fibres Optiques rack is made up of all the controls to adjust the output power (intensity of the source or attenuation), the duration and the frequency of light pulses. The rack includes all functional commands (On/Off, security, etc. 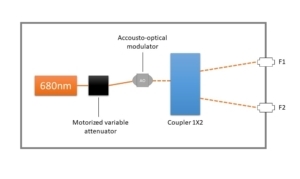 ), a motorized variable attenuator for light attenuation, an accousto-optical modulator for generating output pulses and a front panel interface. 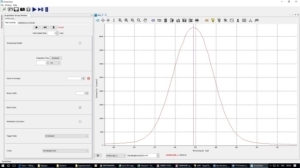 The emission of the pulse can be generated internally or externally with a delay generator.